This entry was posted on Wednesday, October 13th, 2010 at 9:35 am and is filed under Food! Glorious food!. You can follow any responses to this entry through the RSS 2.0 feed. You can leave a response, or trackback from your own site. This kind of ‘paleo’ rule applies to many aspects of our life, not just food. I often ask myself, “have we been doing this for 50,000 years?” to think about predictable human behaviour. Love the graphic … and happy to give you (rather than the person who had posted it without attribution) credit! I don’t see a way to contact you directly, but I would like to use this excellent graphic (with appropriate attribution) in a patient advice leaflet for handing out at my acupuncture clinic. These will be printed, but not sold, and will be for patient education purposes only. If you agree to give me such a permission, please feel free to contact me via the email address provided with my comment. Thanks. PS – you should consider having this made into a poster. Hi Scotlyn! Thanks for contacting me! Your brochure/leaflet looks amazing! And the most essential product for the government recommended guidelines the grains do not even make the cut. What a shame. This graphic is AMAZING! 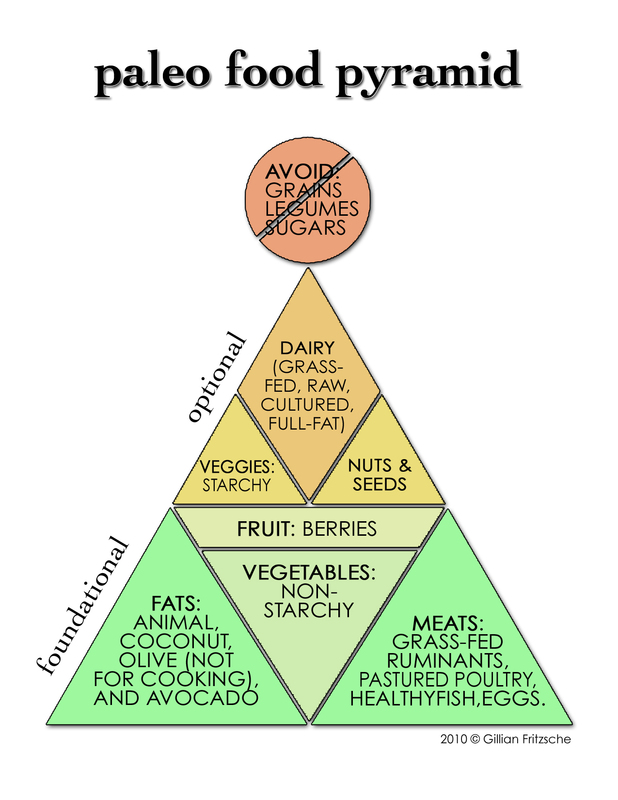 I am currently working on a blog post: Paleo Zone for Dummies and this, in my opinion is the best paleo pyramid II have come across. May I use it? I will give full credit and a link to your site! Where does raw honey fit in? That’s a great question. I missed that! I’d put it right at the tip between optional dairy and sugars to avoid. Honey is great in small amounts but for people who are metabolically deranged, it could affect BG levels in an adverse way. So, if I were to revise the chart, I’d put honey at the very end of optional.